I was for the first time thirsty and for the first time my legs wouldn’t listen to me anymore. 20 km running is in these 2 ways so different than a 10k. I almost stumbled to finish the run. But hey, it’s been my first 20k run and it feels great! I couldn’t wait to get home in bed and to drink 10 gallons of water. Despite everything, the weather was perfect with the cool wind blowing gently in the Forest Hill village where I run. It’s also the first time I started easy and being able to keep a steady pace a bit over 5 min per kilometer. I usually run like a maniac always checking my pace and it’s just brutal. But, after all, it appears to me I enjoy more running further than faster. Not that I don’t care about pace anymore. I managed to get a great 5:21 min per km and it is good enough achievement to me. I’m running like a caveman. Probably I will always do. I cannot follow any training. I basically jumped from 10k to 20k in one run. Forget about increasing gradually, it’s not for me. Now my only concern is to not get an injury. I’m just too obsessed of putting my shoes on and just doing it. Sure, I’m reading books of famous athletes like Dean Karnazes, Charlie Engle or the one I’m onto it now, Chrissie Wellington, a world top Iron Man winner but it’s mostly for the motivation, for the shivers down my spine – they truly make me run more, no doubt about it. Following their advice? Heck no. In a way, listening to everyone and following no one is the way it should be, because we are all different. And after all, it’s not much advice in these books anyway. But boy, isn’t their stories a pure drug?!? I just cannot get enough of it! The perfect weather last night was just too hard to miss. The cold brisk air was perfection. I knew it I will run longer because I thought for the whole weekend about it though I planned for Sunday morning and I ended up running in the evening after some walks with my wife, 2 steaks, one beer and a cheesecake plus some other stuff I don’t remember. But I knew it, when going out the door, that I am set for 20k. 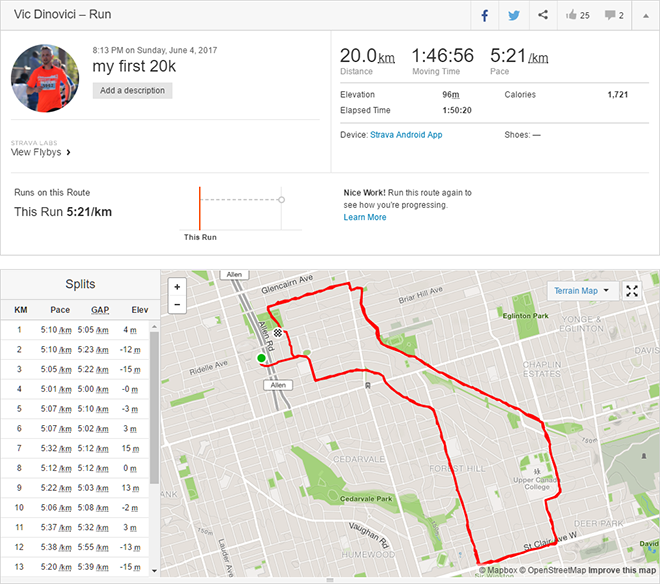 I had some thoughts about doing 21 so it was half marathon but by the time I was running the last kilometer I was on jelly legs so I ended up stopping at 20 which is not bad anyway. When people say, running is hard on knees I never believed them until last night. Even today my knee caps are all painful. Well, I also walked to work as I usually do, so these 9k in the morning count as well. I never had issues with my knees while running but I do feel pain while on bicycle, especially uphill. It was all great for the first 15-16 km, then the pain started and for the last kilometer or so it’s a bit blurry. The music helped me keeping a steady pace. BTW, I will be creating soon a new playlist in Spotify with an increased tempo then the current one. Some really great songs. Now put on your running shoes and go for a run. Just do it.